If you have a business in or around North Lauderdale and are in need of custom sign services, then come check out Testa & Sons Signs! We have been working with hundreds of businesses and companies in and around North Lauderdale. We offer the best options when it comes to building and installing custom signs! All types of companies turn to us first for the best business signs in North Lauderdale. It can be tough to find the right sign company in North Lauderdale., especially when you want to have the very best business signs in North Lauderdale. You may have a specific sign design in mind and feel troubled about placing your trust in just any sign company. At Testa & Sons, you can count on us to bring your custom sign ideas to life. We are professionals in the business who make sure that each detail is handled to help provide the best possible sign for you. Whether you need interior signage, a storefront sign, or channel letters, we can create and install exactly what you need. 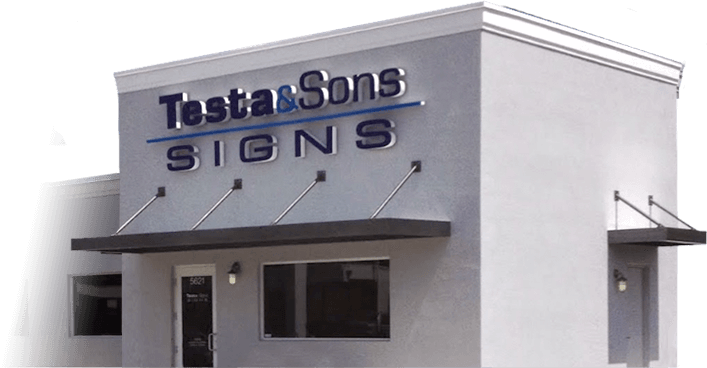 Don’t settle for simple or traditional business signs in North Lauderdale when you could have the very best with the help of Testa & Sons Signs. Let our company provide the signage you desire to promote your business in the most successful way possible. To go over your specific custom sign requirements or get more information, call Testa & Sons today. We know you will be satisfied with the result of your manufactured sign. Contact us to get started on your custom signs project!